Kids Exposed To Meth In Womb Can Struggle With Behavior Problems : Shots - Health News Meth-exposed children are more anxious and depressed at age 3, a new study found. And they tended to be more disruptive at age 5. 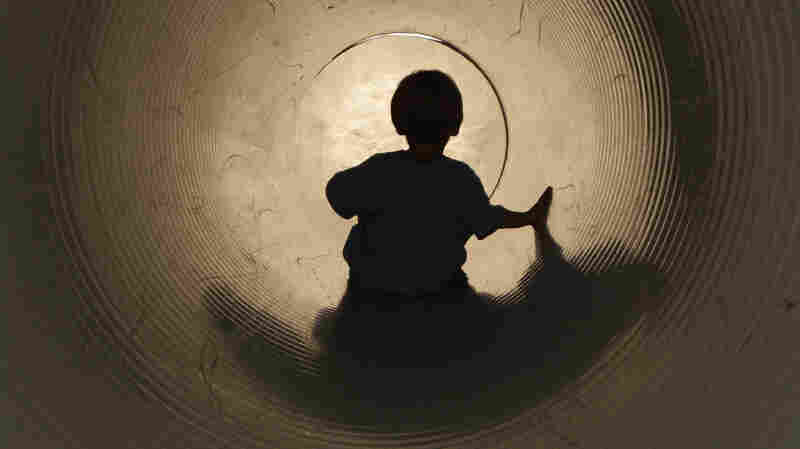 But researchers say those problems are manageable if children and parents get help early on. Children exposed to meth may have more problems with anxiety and depression. Children who are exposed to methamphetamine before birth can have behavior problems as young as age 3, a new study finds. But those problems are manageable, the researchers say, especially if the children and their parents get help early on. "These kids are not cracked and broken," says Linda LaGasse, an associate professor of pediatrics and Brown University Medical School, and lead author of the study. "But they do have problems that are worthy of note." This first study to track the health of meth-exposed children brings up memories of the "crack baby" stories of the early 1990s. Back then, the newspapers were full of horror stories predicting that the crack cocaine epidemic would produce a generation of severely damaged children. Since then, it's become clear that while crack-exposed children do have differences in thinking and behavior, those differences are subtle in most cases. This new study, researchers followed 166 children in the Midwest and West who had been exposed to the stimulant methamphetamine before birth. It then compared their behavior to that of similar children who hadn't been exposed to drugs. The meth-exposed children were more likely to be emotionally reactive, anxious, and depressed at age 3. And they were also more likely to show aggressive behavior and symptoms of attention-deficit/hyperactivity at age 5. That was especially true in children whose mothers were heavy users. Both groups of children acted like that at age 3, but kids who hadn't been exposed to drugs outgrew the behavior as they neared school age. It's the first and only long-term study of the effects of prenatal meth exposure, LaGasse says. It was published in the journal Pediatrics. The researchers tried hard to adjust for other issues in the family's life, including poverty, psychological problems in the mother, family instability and the mother's occupation. Those factors can have powerful effects on a child's behavior. "A lot of times families that are involved illicit drugs have many other issues," LaGasse says. She also studies the effect of cocaine exposure on children. "These kids are vulnerable, and they get raised in vulnerable environments." The drug exposure becomes just one of the many difficulties that can cause long-term problems for a child. "It's important to recognize complexity," LaGasse told Shots. "It would be easy not to. But you can't do that here." That children were anxious and depressed so young worries her, she says, because those children don't tend to get the attention of parents and teachers like the disruptive or impulsive children do. "These are the ones who are quiet. They may cry; they may be withdrawn." But those children risk having problems forming friendships and getting along in school because of their emotional reactivity, she says. Identifying meth-exposed children early on would be a big help, she says, because it's much easier to correct behavior problems in preschoolers through parenting classes and other interventions than it is in older children. "This is a time when you can really make a difference in children's lives."